With friendly people, idyllic beaches, colourful history and delicious cuisine, Vietnam has something to offer every traveller – it’s a place to lose yourself in a heady mix of past and present. 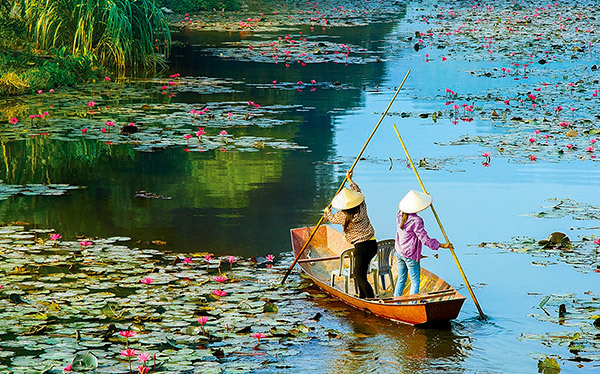 APT, Australia’s leading escorted touring company, offers a range of extended holidays in Vietnam, taking in the diverse mix of sights and sounds on offer. Explore the cities of Vietnam, which charmingly combine their French colonial influences with chaotic streets that are filled with markets, mopeds, cyclos and scooters. Enjoy an authentic rickshaw ride in the Old Quarter of Hanoi and take in a traditional water puppet show. Visit Ho Chi Minh, Da Nang, Vietnam’s fourth largest city, and Hanoi as well as ancient trading towns like Hoi An, a World Heritage listed site, where you can investigate the museum, old Chinese merchants’ houses before travelling by sampan on the Thu Bon river. Step beyond the cities to discover a raft of timeless landscapes – soaring mountains towering over tiny villages, incredible beaches extending along the coastline, and the seemingly endless green patchwork of rice paddies. Learn how to prepare some of Vietnam’s best known dishes and check out local village markets. Venture through craft villages, laze on sandy beaches, discover the ancient capital of Hue. The temples are legendary – such as Minh Mang, set amongst tranquil gardens and lakes, and the tomb of Emperors Tu Duc and Khai Dinh and the Royal Citadel with its imperial Purple City. Undoubtedly a highlight, a seven-night cruise along the Mekong River aboard the MS La Marguerite provides an unforgettable journey between Cambodia and Vietnam. The ship is the newest and the most luxurious to operate along the Mekong, offering colonial elegance and local artifacts. Throughout the cruise, passengers relax in stylishly appointed Staterooms and enjoy excursions to unforgettable sights, such as the eco-village of Cheung Kok and the wetlands of the Tonle Sap river. There are also plenty of visits to the many floating markets that have made the Mekong famous. APT offers a range of tours for you to fully discover Vietnam, ranging from 11 to 22 days. Their 15 or 18 day Indochina Adventure includes 41 meals, domestic flights in Vietnam, the services of a professional Tour Director, tipping for land touring, cruise and local guides, a range of signature sightseeing experiences and accommodation in some of the finest hotels each region has to offer.